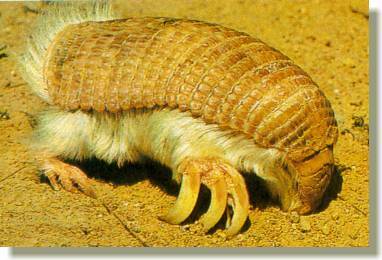 One species of pink fairy armadillo (C. truncatus) is recognized. 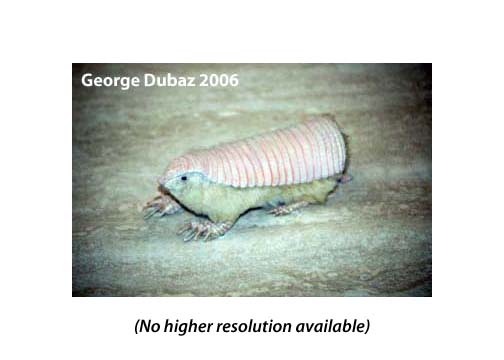 The pink fairy armadillo was previously considered to be closely related to the greater fairy armadillo (Calyptophractus retusus) but more recent evidence has shown that the greater fairy armadillo deserves its own genus. Head and body length: 84 — 117 mm (3.3 — 4.6 in). Tail length: 27 — 35 mm (1.1 — 1.4 in). C. truncatus is the smallest of the armadillos. The shell is pale pink in color, anchored to two large, rough prominences in the bone above the eyes and by a narrow ridge of flesh along the spine. The legs, undersides of the body and under the shell is covered with soft, fine white hairs. All bands of the shell across the neck and body move freely. C. truncatus is the only armadillo with the dorsal shell almost completely separated from the body. A bone plate in the shell at the rear of the animal is securely attached to the pelvic bones. The tail is spatula-shaped, and protrudes from a notch in the rear plate. The tail cannot be raised, and as a result drags behind the animal as it walks. Females posses two mammae. 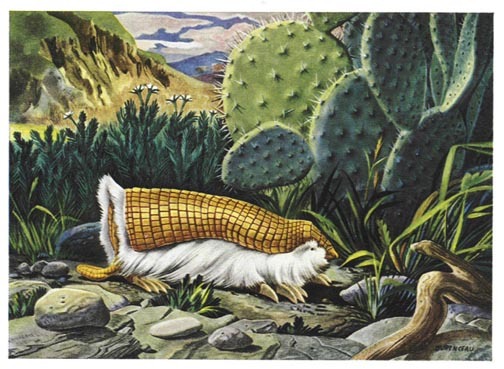 The pink fairy armadillo inhabits dry grasslands and sandy plains with thorn bushes and cactus. C. truncatus is nocturnal, and sluggish except when burrowing. It can burrow rapidly enough to completely bury itself within seconds when threatened. When digging, the animal supports its hind end using the tail, and quickly throws dirt underneath and behind itself, using the front feet to pile up dirt beneath it and the hind feet to shove the dirt away. C. truncatus often uses the flat armor plate at the rear to plug the opening of the burrow, like a cork. Burrows are often found near an anthill, preferably in dry soil that feels uncomfortably warm to the human hand. C. truncatus will leave the burrow if it rains enough to moisten the soil. C. truncatus feeds primarily on ants and ant larvae; they are also known to eat worms, snails, roots and other plant material. C. truncatus does not do well in captivity. No specimens of C. truncatus have ever survived more than four years in captivity. C. truncatus is classified as endangered by the IUCN and the USDI (1980), due to habitat reduction by agriculture and predation by domestic dogs. Do you have a picture of C. truncatus that you would like to donate to this site? Please see the Armadillos Wanted page to see how you can help. Nowak, R.M. 1999. Walker’s Mammals of the World, 6th edition. Johns Hopkins University Press, Baltimore, MD. 158-168. Additional references listed on the Sources and Credits page.